The Princeton Varsity Club recently coordinated a trip for several Princeton teams to work with Habitat for Humanity as part of the ongoing service series “Weapons of Mass Construction.” In coordination with the Pace Center for Civic Engagement, Princeton varsity student-athletes, representing a variety of sports, spent the day in Trenton, NJ working on a build site alongside other community groups. Click here for video highlights of our Princeton student-athletes at the Habitat build site. “Our athletic program aims to complement and enhance the educational mission of the University and aims to provide our student-athletes with the opportunity to achieve, to serve and to lead. The Weapons of Mass Construction service series is an extension of our belief in the value of Education Through Athletics and a wonderful opportunity to connect and directly benefit the surrounding community” said Mollie Marcoux Samaan ’91, Ford Family Director of Athletics. Founded in 2009, the Weapons of Mass Construction program is a way for undergraduate student-athletes, coaches and administrators to give back to the region. 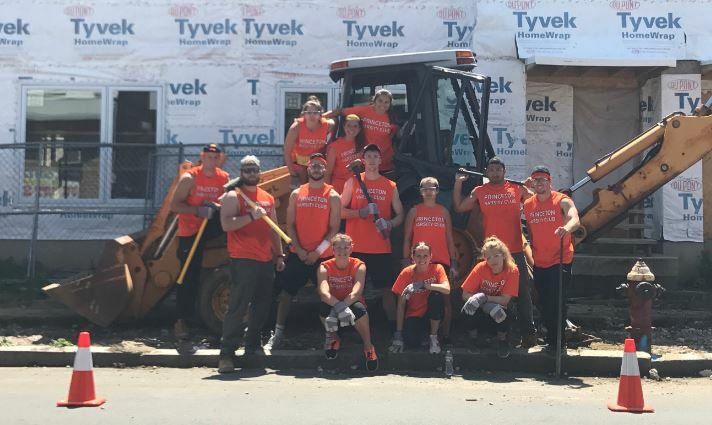 The Princeton Varsity Club has partnered with several non-profit organizations as part of the program, including HomeFront, Community House, Isles Inc., the YMCA of Trenton, the United Way of Greater Mercer County, Jersey Cares and Habitat for Humanity. Projects have included building community gardens, restoring hurricane-damaged properties, refurbishing community centers and renovating the future site of a sustainable urban village.